In the previous post, I began discussing functional magnetic resonance imaging (fMRI), a popular but controversial experimental technique that allows researchers to investigate brain activity in humans and animals in a relatively safe and non-invasive way. But I found myself commenting more on the problems associated with statistical methods. While these problems are important to acknowledge and deal with, they are not specific to fMRI. In this post I hope to leave stats aside, and examine some of the biophysical assumptions underlying interpretations of fMRI studies. For some years I had been ignoring fMRI papers because of the myriad problems of interpretation, but a recent paper from Aniruddha Das’s group at Columbia University (Cardoso et al., 2012) rekindled my curiosity, and spurred me to survey the literature on the links between neural activity, blood flow, and metabolism in the brain. “It’s a long way from behaviour to BOLD.” From Singh (2012). Click to view full size. Despite its popularity, it is still not entirely clear what fMRI is measuring. Many people know that the technique measures a signal called BOLD: the blood-oxygen-level-dependent contrast. But I imagine fewer people know that the relationship between blood flow and neural activity is still under active investigation. This is vividly illustrated in the figure above, taken from Singh (2012). When people point to an fMRI heatmap and say that some brain region or the other “lights up”, what they mean is that oxygenated blood is flowing into this region at a rate that is higher than some baseline. (See my previous post for a discussion of baselines and subtractions.) Interpreting blood flow as neural activity rests on a key assumption: that neural activity is coupled with increased blood flow. Blood flow, in turn, is assumed to correlate with metabolic activity. The idea rests on a line of thinking that is intuitively straightforward [but see notes]. Neural firing activity and synaptic change both require energy in the form of glucose. The brain does not store glucose –it produces it locally as needed, with the help of oxygen delivered through haemoglobin in the blood. So we would expect increased neural firing to necessitate increased flow of oxygenated blood. In summary, the simplest description of fMRI is that it measures oxygenated blood flow, which changes as a result of oxidative metabolic processes that drive neural firing. But none of the steps in this purported chain of causation (Neural Activity > Metabolism > Blood Flow) has been fully understood, so as usual, the devil is in the details. To understand the typical view of fMRI, an analogy might help. Let us imagine a modern city, most of whose inhabitants require electricity to do their work. Imagine that the city planners wish to know how many of the inhabitants work at night. They can’t go from house to house to check, so they decide to monitor electricity usage, for which they have accurate meter readings. They assume that no one works in the dark, no one sleeps with the lights on, and that lights and machines cannot be turned on automatically. They also assume that the engineers in charge of the power plants do not actively change or redirect electricity flows. If these assumptions are correct, then the meter readings can be aggregated to create a heatmap of the city’s nocturnal work habits. The more people work at night, the more electricity they draw from the grid. Thus electrical power usage becomes a useful stand-in for human activity. Researchers who use blood flow as a proxy for brain activity are like the city planners who use electricity usage as a proxy for nocturnal work activity. But in the labyrinthine metropolis that is the brain, perhaps some inhabitants don’t need that much power? Perhaps some need a lot? Perhaps the engineers in charge of the power plants, by virtue of a holistic, long-term, and wide-angled view of the needs of the city, can anticipate which neighborhoods will need the most power at any given time, and preemptively allocate it? A recent study from Aniruddha Das’s group (Cardoso et al., 2012) adds to a growing body of work that should encourage us to take that last possibility seriously. They looked at the correlation between blood flow and neural activity, and found that the blood flow signal was not just coupled with neural firing — it had more to say! The research team examined neural activity and blood flow simultaneously — but instead of using fMRI, which is a coarse measure, they used a technique called optical imaging. Since the technique is invasive, it cannot be done in humans, so it was conducted with rhesus macaques. They investigated the responses of cells in primary visual cortex (V1) to periodic sensory tasks. The monkeys had to fixate on a visual stimulus, and if they succeeded, they were rewarded with juice. Monkeys love juice. Cardoso, Das and colleagues found that the blood flow signal could be decomposed into two separate signals — one that was linearly correlated with stimulus-triggered local neural firing, and another than had no connection with local electrical activity or the visual stimuli being presented, but instead was related to the task the monkey was performing. Prior work (Sirotin and Das, 2009) from the same group showed that this non-sensory component of the blood flow signal is anticipatory, and can preempt the behavior of the monkey. Cardoso et al. 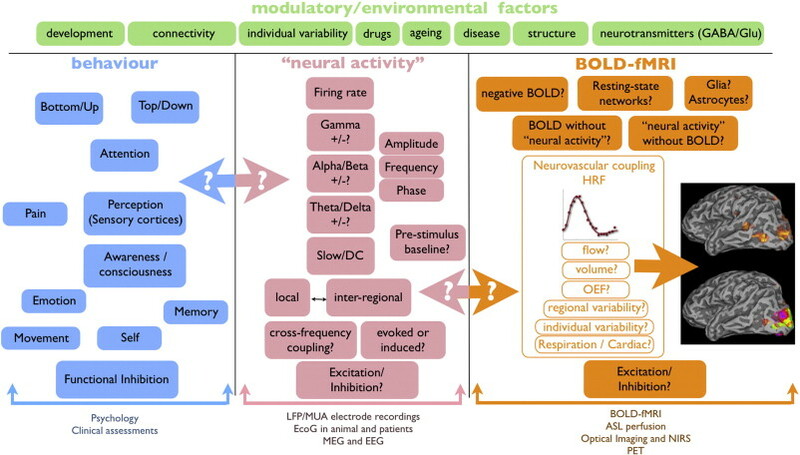 suggest that the non-sensory component of the BOLD signal might reflect neuronal processes that have nothing to do with stimulus-driven spiking activity. The BOLD signal might reflect neural modulation of blood flow via top-down executive control or via a timing signal from the brain stem. This line of research is exciting to me for two reasons. Firstly, it points to a potential source of ambiguity in interpreting fMRI studies that assume the BOLD signal is a perfect stand-in for local firing rate or local field potentials. If these results hold up, it means that the BOLD signal carries at least two pieces of information — one about local neuronal activity, and the other about anticipatory or preparatory task-related activity. Researchers must be careful about interpreting a BOLD signal as neural firing — perhaps in some situations only task-related blood flow is being modulated. In such situations a brain region might “light up” even when its neurons are not electrically active. If researchers are interested in localizing neural firing, they must be sure to subtract out all irrelevant aspects of the signal [but see note 5]. The second source of excitement relates to the anticipatory component of blood flow. Most of us are not interested in the electrical activity of the brain for its own sake — we assume it is the most important physiological phenomenon in the brain, underlying adaptive human and animal behavior. We typically assume that cognition, emotion, memory and control over the body are subserved primarily by neurons. But what if anticipatory blood flow is itself an adaptive process? If this implies too radical a paradigm shift, consider this possibility: neural activity in some brain regions may play a role in modulating the blood flow elsewhere. This could be an extension of the brain’s role in monitoring and controlling bodily states. Perhaps there are metabolic coordination centers in the brain that can influence blood flow? Perhaps active resource allocation can improve speed and efficiency? Perhaps some parts of the brain assess contexts and goal states to infer which brain regions will require additional metabolic resources in the future. There is evidence that the locus coeruleus may participate in the active modulation of blood flow (Bekar et al, 2010). To return to the city analogy, perhaps the engineers running the power stations can anticipate when and where power usage will be particularly high — say, during wartime, or in periods of creative expansion and neighborhood renewal — and redirect power actively, as peers of the city planners, rather than as passive subordinates. Studies such as these serve as an important reminder that the brain is not simply a computer manipulating abstract information — it is also like a city with a bustling economy that requires energy and raw materials for its growth and maintenance. Resource allocation via blood flow and other mechanisms may therefore be an active, adaptive process, and therefore as important to neuroscientists as neuronal signaling. If you spot errors, desire clarification, or have comments / additional citations, feel free to let me know in the comments section! “[F]ocal, stimulus-induced increases in brain blood flow are driven by local metabolic demand“. This hypothesis has been around since at least 1890, and has since been almost universally accepted, despite some important critiques by researchers such as Peter T. Fox, whose group has carried out experiments that indicate that blood flow and metabolism are not very closely coupled. For example, in a study from 2010, his group concluded that the cerebral blood flow response is “mediated by factors other than oxygen demand”. A complete picture how neural activity, blood oxygen, and cellular metabolism depend upon each other must also incorporate astrocytes and other non-neuronal brain cells — cells that were until recently assumed to serve custodial and infrastructural purposes, but are now believed to play active roles in signal transduction and memory. The review by Heeger and Ress (2002) is also worth looking at. The topic of neural activity and metabolism is far too complicated for a single blog post — maybe to fully understand we must “solve the brain” (!?) — so it’s important to glance at the primary literature from time to time. A somewhat bipolar commentary on this paper by Karl Friston (2012) seems to suggest the fMRI community was well aware of the task-related component of the BOLD signal. He says “they have chosen to use their set-up to largely confirm things that have been known for over a decade”. And yet he goes on to say that the “implications of their findings are far-reaching”. Not sure what to make of this. Posted on January 23, 2013 by Yohan. This entry was posted in Uncategorized and tagged fMRI, neuroscience. Bookmark the permalink. Does fMRI measure only synapses activity, axons activity or both? I’m asking this because the (synaptic) origin may be in a particular location (in other words, processing is happening there), but long axons, which are just transport mechanisms, may lead the activity wrongfully to other areas. Neither! fMRI measures something called the BOLD signal: http://en.wikipedia.org/wiki/Blood-oxygen-level_dependent. This post explores the connection between spiking activity and BOLD. The two processes are not completely correlated, so there are still aspects of it we do not understand. You can get blood flow without spiking, and spiking without changes in blood flow. Not sure what you mean about activity being led “wrongfully to other areas”. Have there been any studies on the differences between the fMRI activation in brains of experts and beginners on the same tasks? One has to take these studies with a pinch of salt. fMRI results are notoriously inconsistent from one study to the next. Interesting, thank you! Found your blog most helpful. Is there a method for measuring de-oxygenated blood? The BOLD signal in fMRI is one way of measuring this. And the studies here from Das’s group use a different, invasive technique in monkeys.